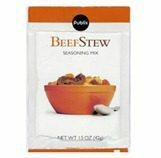 Publix is recalling their Publix Beef Stew Mix, made by McCormick & Company, Inc, due to the possibility that it may be mispacked with brown gravy, and may contain undeclared milk. Some shoppers with milk sensitivities or allergies may have an allergic reaction if they use this product, according to the company. Publix also stated that there have been no health issues reported due to the possible mixup. They are asking shoppers who bought the affected mix to return it to Publix for full refund. Publix said that customers with questions can call them at 1-800-242-1227, the company also provides additional information on its website here. The beef stew mix was distributed to Publix stores in five states, Alabama, Florida, Georgia, Tennessee and South Carolina.